Ten years a pro and an essential cog in the wheel of Liquigas's Grand Tour attack machine; not to mention a winner on the legendary slopes of the Ventoux. And all of those years with Italian squadra - he's even lost that famous Polish love of good beer; in favour of fine Italian wines. Sylwester Szmyd recently took time to talk to PEZ. PEZ: Your 10th pro season; does it get easier or harder as each year goes by? Sylwester Szmyd: I think it gets much easier; I feel more experienced and stronger mentally and physically year by year. Szmyd was already a seasoned pro when he raced for Marco Pantani's Mercatone Uno squad in 2003. PEZ: Did you grow up with stories of the great Polish stars of the 70's and 80's - Szurkowski & Szozda? SS: No, no, I'm too young, I could rather say: Jaskula or (earlier) Halupczok. PEZ: Ten years, all with Italian teams - why? SS: Because I think that Italian teams have a good attitude to cycling - a kind of cycling mentality - and I haven't had any more interesting offers from other teams up until now. PEZ: How much break did you have in the winter and what do you do during it? SS: I didn't do any physical exercises connected with cycling for more than one month and during that period I enjoyed time with my family and friends. I spent two weeks in Poland and a few days in Tuscany, travelling between Siena, San Gimignano and Elba. PEZ: Are you a 'kilometres' or 'scientific' trainer? SS: I never look at kilometres; I go training keeping in mind the particular work I have to do and the number of hours I want to spend on the bike. 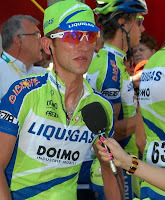 PEZ: How many training camps do Liquigas have? SS: Many - five, six or even more. PEZ: What's your 2010 programme? SS: I begin at Vuelta Catalunya, then Trentino, Romandie, Giro d'Italia, Dauphine Libere, Tour de France and Tour de Pologne. PEZ: Where are you based during the season? How often do you go back to Poland? SS: Usually in Italy, in Montignoso in Tuscany near Liguria. Every time I have some free weeks; at least 4-5 times in a year, I go back to Poland. PEZ: You won on the Ventoux, last year - tell us about that, please? PEZ: You've ridden the Giro, Tour and Vuelta; which is your favourite and why? SS: The Tour is the Tour - the biggest race in the world and you feel it when you are there. But I think the Giro is the most beautiful - the stages, mountains, landscapes, people...everything. PEZ: The Tour of Poland - that must be a cool race for you? SS: Dauphine Libere and Tour de Romandie. PEZ: Anything new with the Cannondales for 2010? SS: We have already been testing it last year so in 2010 the bike should almost be the same. PEZ: Are you an equipment fanatic, or do you just leave it to the mechanics? PEZ: Ten years in the sport - the biggest changes for the good, you've seen? SS: The fight against doping with the ADAMS system (Anti Doping And Management System) but almost only in cycling - it should refer to all kinds of professional sport. PEZ: And changes for the bad in the last ten years? SS: As above, the fight with doping, blood control, out of competition controls should be extended to other sports. PEZ: Can Ivan Basso win the Giro? SS: He has already won the Giro so I know he can still repeat it. PEZ: What do you do when you're not cycling? SS: I'm working towards my pilot's license, so when I'm not sitting on a bike I try to spend as much time as possible in the air, preparing to be a pilot. I also like riding my moto and listening to Depeche Mode music whose vinyls and cds I collect. PEZ: Your goals for 2010? SS: To do my best in the mountains for my leaders at the Giro and the Tour and personally, achieve some more victories in minor races. PEZ: Tyskie (Polish beer) or Vodka? SS: Brunello (rich and spicy red wine from Tuscany) or Amarone (rich and full-bodied red wine from the Northeast of Italy) .